FAMILY has always been important to Dina Holdsworth and so has a sense of community. That is why she is embracing the plans to transform the mill in which she has invested decades of her life. John Holdsworth and Company in the the Shaw Lodge Mills complex has been part of Halifax for more than 180 years. It has been overseen by no fewer than six generations of the Holdsworth family and through years of both feast and famine, it has carved out a name for itself as a market leader in the manufacture of upholstery fabric for the transport industry. Indeed, park your bottom on any bus seat anywhere in the world and the chances are you will be sitting on a top notch bit of moquette, made lovingly at Shaw Lodge. But times move on. 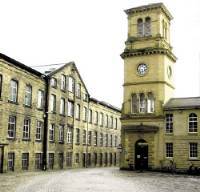 Manufacturing will continue here for the time being but Calderdale planners are now poised to give the nod to transform the site into an urban village with housing, a hotel, shops, leisure complex, even a health centre for the benefit of the new villagers. 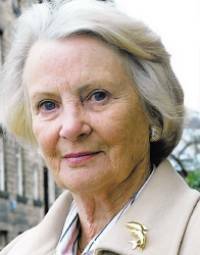 No one is more aware of the need to move with the times than Dina, who became a member of the Holdsworth family when she married William, a fifth generation Holdsworth in 1946. Originally from Holland, Dina settled into married life quickly in Halifax where she remembers that "There was black smoke everywhere you looked. "The only time the skies were clear was during Wakes Week," she laughs. She became instantly involved with the mill despite bringing up a sixth generation of Holdsworths. After William's death in 1969 she became "absolutely actively hands-on," becoming chairman in 1972. She may now be retired but there is no doubt that the company and its employees will always remain close to her heart. "You can't stand still. You can't stop progress and if Holdsworth's has to move on then it has to be in a good way. It has to be the right move forward and I do believe this is it," she says. "What struck me as a young woman when I arrived here was this strong sense of community, a sense of family. The Holdsworths weren't the only family who had been here for generation upon generation. The workforce reflected that too," she says. "We saw employees working here for years who were then followed by their children and even grandchildren. If there was another generation wanting to come along then there was a job for them. Everybody seemed to know everybody. "I think that's incredibly important because you create a workforce then that cares and you have employers who care about their workers." In some way, Dina believes the new plans proposed for Shaw Lodge will ensure this sense of community prevails. We take a tour of the buildings, treading the cobbled lanes where thousands of mill workers - and Holdsworths - have trod before us. "It would be a travesty if these lovely old buildings were left to go to ruin. They should be preserved because they are part of the fabric of the town. There is a lot of history here and now that history is to get a new lease of life. "A village here will bring back that feeling of community and family. I am sure of it." I ask if she has put her name down for one of the retirement flats and she responds with a laugh. "I might well do that. After all this place has such happy memories for me," she adds before pointing out the top floor of one building and describing Christmas parties of yesteryear. "All the workers came with their children and my children came too. Even when you are not actively involved with a place any more, you don't stop caring. Shaw Lodge Mills has been a huge part of my life and I am so proud of what it means." Dina is a great traveller and she reveals nothing gives her a greater thrill than to see Holdsworth's famous upholstery fabric in every corner of the world. "It is global and that is amazing for a product that is made here in Halifax. I have been to the weirdest places in the world and seen it," she says. "I once got off the plane in the Yemen and boarded this little shuttle bus and there it was. I am always snapping with my camera. People think I'm mad." She confirms that yes it is true it graces the seats of the Orient Express Northern Belle train and the sharp-eyed will have seen it on the seats of the bus, driven by Keanu Reeves in the hit movie Speed. "It's important to look to a new era now and I do believe building a new village here would be a fitting legacy for the Holdsworths to have left behind. These buildings need people and this area needs to be alive. It would be tragic to let it all die away." If planners give their consent to the application tomorrow, then Dina Holdsworth - and perhaps all those generations before her - will have her wish and another chapter in the story of John Holdsworth and Company will begin. With acknowledgement for narrative contributions from The Halifax Evening Courier.